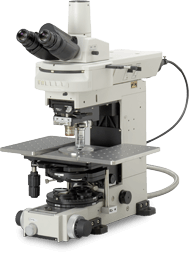 Nikon Upright microscope ideal for electrophysiological experiments. By inserting a spacer between the body and the arm, you can raise the microscope height 10-30mm to facilitate large specimen observation. Moreover, the condenser, sub-stage and turret can be completely removed to allow for more free space, depending on the purpose of the experiments. The FN1 features an ON/OFF mechanism for the filter turret, optical path changer, magnification changer and the condenser filter changer to reduce vibration related noise. A new holder for CCD cables eliminates vibration noise emanating from air conditioners, open doors or windows. New ground pins for objectives lens, condenser and objectives sliders substantially decrease electrical noise. The microscope’s arm has been set back further and allows users to view and operate from directly above a specimen. In addition a new transmitted light fiber illuminator provides bright but cool illumination to living specimens and eliminates electrical noise from the microscope environment. Objectives mounted on the sliding nosepiece can be raised when switching magnifications thus preventing the objective from colliding with the manipulator or the chamber. The retraction distance is 15mm, so even a thick glass dish is protected. The lens top can be easily dipped (approximately 1mm) into the bath solution by using the lever to eliminate the risk of specimen disturbance. The new Plan 100xW objective (NA 1.1, W.D. 2.5mm) is the world’s first water dipping lens with a correction ring. This ring corrects spherical aberration induced by imaging deep in tissue or by working at physiological temperatures — providing outstanding z-axis resolution in IR-DIC imaging, as well as a tight point spread function for confocal applications. With excellent IR transmission, this lens is a terrific choice for Multi-Photon imaging. The new CFI75 LWD 16x 0.80 NA objective features an industry unique working distance of 3.0mm and a 45° manipulator approach angle. This best-of-breed combination of numerical aperture, long working distance and approach angle allows for a usable one-lens solution for electrophysiology applications. And, when used with the variable magnification double port, it allows you to vary intermediate magnifications between 0.35x, 2x, and 4x. It is also possible to observe from a low magnification, wide field to a high magnification, high resolution field with the 16x objective alone. A new set of physiological water dipping objectives have been developed for the FN1 featuring longer working distances of up to 3.5mm, with slimmer profiles, 45 degree approach angle for easy access of manipulator patch needle placements, special coated top lenses to prevent bubbles and new axial chromatic aberration correction for visible to near infra-red imaging. To enable deep penetration optical contrast techniques, a new IR wavelength selection turret has been adopted providing the highest contrast selection of visible, near IR and IR DIC image modes. A new condenser with 8.2 mm of working distance, usable for DIC and new Oblique Illumination techniques offers vibration free operation and both the filter turret and condenser as well as the main body of the FN1 are completely sealed against water leaks. The simple and slim I-shaped body has no projection on the body other than the focus knob, so there is more space in the working area for your experiment. This also provides better access around the microscope to position manipulators and other peripherals. With the eye-point of the body 25mm lower than conventional models, you can work in greater comfort. The objectives boast a long WD of 2.5-3.5mm (longer than 2.5mm even at 60x or 100x) taking advantage of the 60mm parfocal distance of the CFI60 optics. Since there is ample space above the specimen, microelectrodes can be easily inserted. In addition, the diameters of the objectives are 17% slimmer than previous lenses, and provide broad approach angles up to 45º, facilitating dramatically enhanced access of microelectrodes to the specimen. The lens top has been treated to prevent bubbles from becoming attached to it.